Located in one of the areas with the lowest rate of rainfall on the planet, Nazca attracts thousands of visitors every year due to its mysterious lines, giant drawings which can only be truly appreciated from the air. Certain people once believed that this was the footprint of extra-terrestrials, but it is now accepted to have been an offering to the gods, an appeal for rain. All the comments below belong to people who have travelled to Peru with Exoticca in the past 18 months. “The hotels were good, comfortable rooms, friendly staff, mostly well placed for exploring from, in any time we had free. “Hotels first class. Flights very good. Service and transport from Condor Travel were also excellent and all guides were very professional and helpful. 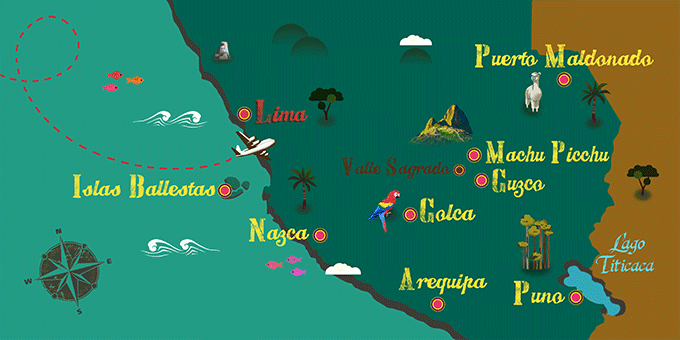 If Nazca has caught your attention, leave us your number so we can call you to discuss the voyage that awaits you.